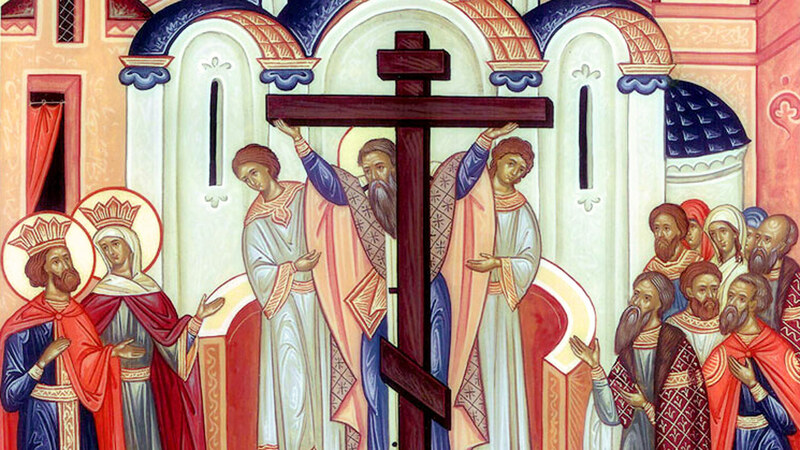 On September 14 the Orthodox Christian church is the Bulgarian nation celebrates one of its most important and solemn feasts - Elevation of the Holy Cross. People call the feast Cross not only because of the "Holy Cross", but because the sun goes back to the winter day "is crossed with evening" and equinox occurs. Women cross (zagarlyat) flowers in the garden, while men keep their waist due to colder weather conditions. In folk beliefs Cross is associated with the beginning of autumn, the time for sowing of winter crops, time of harvest. It is believed that the grapes before Cross is not ripe, but on this day weave baskets vintage, so in places called day and Grozdobernik. On this day, the oldest woman in the household, broil Cross asks (krastashka) - ritual bread decorated with a cross on it. When collect homework, it breaks above the table and calls it "Krastets Cross to hurt me Cross does not hurt," the whole household repeated words. The priest takes on a new church cross woven tablecloth on the table. Farmers donate Pop with pulses and vegetables, especially of wheat from the new harvest. For the holiday are given fresh cakes - this "cereal offering" propitiates elements to donate owner of prosperity. The first grapes are torn consecrated the church and distributes health and fertility. The ritual includes sprinkling holy water on the house and threshing. This day is celebrated healers who treat "ran out to cross," interfere dislocated and sprained limbs and 'fix broken bones. " There is a belief that fasting the holiday is observed against pain. Traditionally Cross observe strict fasting in honor of the Cross of the Lord and not eat anything red, red pepper, tomatoes, radishes, red apples, etc. Ritual table includes cabbage pie with leek, roasted pumpkin, grapes, ritual bread and other mandatory meatless foods. On this day, name day celebrated Krusty baptized, christened, baptized Krastilena, name, name, name, Henna, Kancho, Stavri.